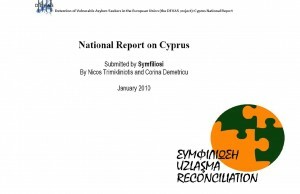 In February 2009 Symfiliosi sent letters to both the Ministry of Interior, which is the competent ministry for immigration and asylum, and the Ministry of Justice which is the competent ministry for the police and the prison system, requesting permission to visit three detention centres in different locations in Cyprus for the purpose of this study. The Ministry of Justice responded that the matter was outside its competency and referred us to the Ministry of Justice, which however did not respond in any way. On 30.03.2009 we phoned the Ministry and were informed that our request was still under examination pending clarifications awaited from the police. At the time it was pointed out to us by the Ministry official that our request would be granted, but did not receive anything from them thereafter. On 13.04.2009 we sent another letter to the Ministry of Justice which was followed a few days later by a rejection letter from the Ministry, arguing that asylum seekers are not detained in Cyprus. On 10.07.2009, following the resignation of the chief of police, we applied to the newly appointed deputy chief of police. The response this time was that we could interview 15 persons, all from a single detention centre (block 10 at the central prison). We wrote again to the police asking for permission to interview another 10 detainees-women held at another detention centre. The reply was negative. In August 2009 a researcher from Symfiliosi visited Block 10 and interviewed 141 male and female third country nationals in detention, most of them former asylum seekers whose asylum application had been turned down and were detained pending deportation.